While we have a wide range of customers visiting our stores from a variety of musical backgrounds, there are some common questions that constantly come up and recently we've noticed a lot of you guys have been asking about In-Ear-Monitoring solutions. Although widely used within the industry, it can be tough to figure out what would work for you and we regularly have customers stop by to chat with us about their options for gigging. With loads of different products on the market, it's a personal favourite of ours that keeps coming up, the magnificent Shure SE425 earphones. Recently taking home the gold at the What Hifi? 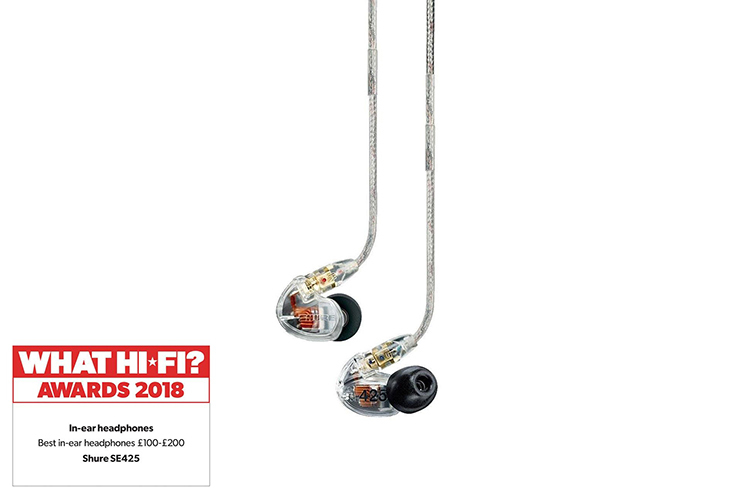 awards, the SE425s have once again been crowned the best in-ear headphones in their price range and we simply cannot argue. Offering a crisp, crystal clear sound that certainly went above and beyond our initial expectations, these are favourites of absolutely loads of gigging professionals and we thought we'd break down why they've become so popular. 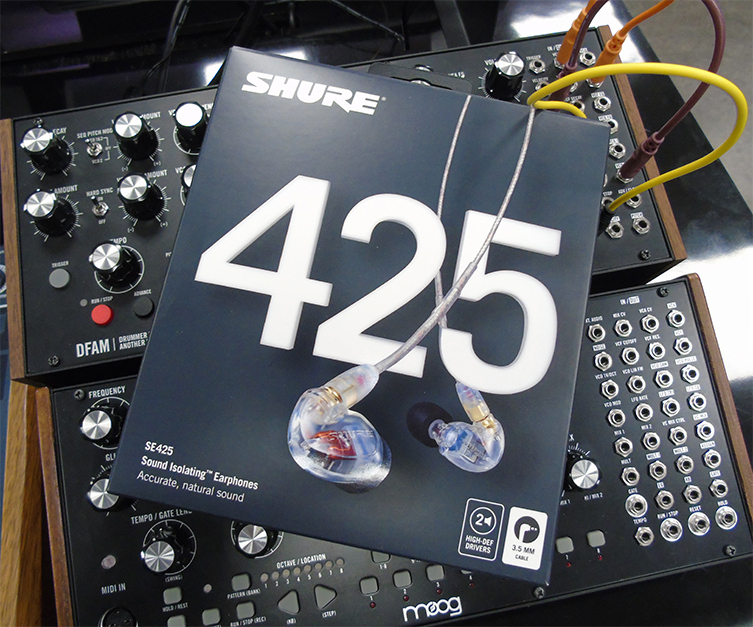 Starting with their price, the SE425s are pretty affordable in comparison to their competition and perhaps this is what helps them to stand out. Despite how fantastic they sound, these headphones won't break the bank and for loads of bands and artist, of course, that's a huge selling point. However, that doesn't mean that Shure have sacrificed on quality at all. Terrific for performing with on stage thanks to the advanced sound isolation technology Shure have used, the SE425s do a great a job of drastically cutting down outside noise. We were really impressed at how well they operate in a loud environment and how easy it is, even with a full band playing, to concentrate on the sound in your ears, as opposed to the sound around you. In regards to the audio quality, the earbuds provide a really clear, crisp and balanced sound with loads of clarity, even when competing with other loud frequencies. Covering a frequency range of 20Hz – 19kHz, you won't miss a moment of your performance when you use these earphones and you'll be amazed at how much more confident you feel when you know you're picking up every single detail. They're plenty loud too and come with three separate sizes in the included 'fit kit', allowing you to experiment and find the perfect fit for you. This is an essential feature when it comes to in-ear-monitoring as a poorly fitted pair which aren't properly sealed will be unable to perform to their fullest potential, particularly when it comes to noise isolation. This also contributes to the comfort of the SE425's which in our opinion is almost as crucial as the sound itself. The last thing you want when you're on stage is to have to battle with an uncomfy set of earphones and Shure have made a point of testing these over long periods of time so you'll genuinely forget you have them in while you're playing. To top it all off, the SE425 earphones are remarkably well built. Despite being pretty small, they are absolutely solid and even make use of a Durable Kevlar® reinforced cable which can be replaced if you do run into any issues. Ticking all the boxes for us and used by absolutely loads of bands on stage, the Shure SE425's have to be the most reliable IEM solution within their price range. We've recommended them time and time again and have yet to speak with any customers who were disappointed by their performance. If you've been thinking of making the jump to IEM for playing live, these just may be the perfect choice!